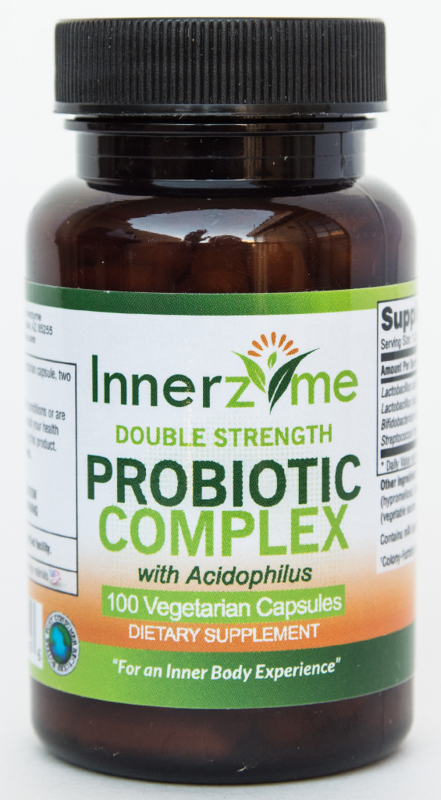 Innerzyme offers a high potency daily probiotic supplement specially formulated with over 6 billion strands of good bacteria per dose including Acidophilus, which is critical for healthy digestion and nutrient absorption. Daily supplementation with a well-balanced probiotic supplement also helps support a healthy immune system by keeping your intestinal flora or “good bacteria” in balance and warding off bad bacteria that causes illness and infections in the body. When it comes to probiotics, think preventive and maintenance health. Also, if you ever take an antibiotic, you should also be taking a daily probiotic as antibiotics not only kill off bad “illness causing” bacteria but also the good, healthy bacteria as well. Other ingredients: Rice flour, vegetable capsule (hypromellose), silicon dioxide, magnesium stearate (vegetable source). Take 1 vegetarian capsule, two times daily.